MBC | Mainline Conveyor Systems, Inc. 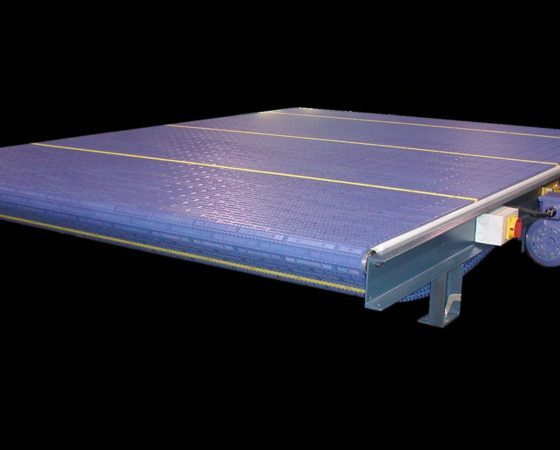 Mesh belt Conveyor employs a plastic link style belt for conveying loads. It has a fixed pitch dimension between the links and is driven by sprockets similar to roller chain. These belts are provided as flat top belts with or without a textured surface. Driving sprockets are mounted on a shaft located near the center of the conveyor length. Multiple sprockets are mounted on the drive shaft at predetermined intervals to support the load to be moved. The exposed belt is supported by a slider bed surface of low friction materials between UHMW side guides.